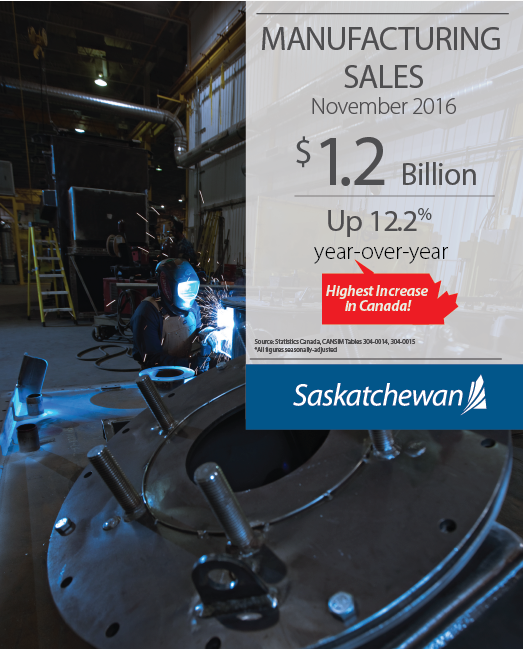 November manufacturing sales in Saskatchewan were up 12.2 per cent over last year (seasonally adjusted), the highest percentage increase among the provinces, according to Statistics Canada. On a national basis, sales were up only 2.1 per cent. All of the provinces posted year over year gains (seasonally adjusted) in November. Major gains for Saskatchewan were recorded in food production, up 25.9 per cent (seasonally unadjusted) and wood products up 22.1 per cent between January 2016 and November 2016 when compared to the same period in 2015.